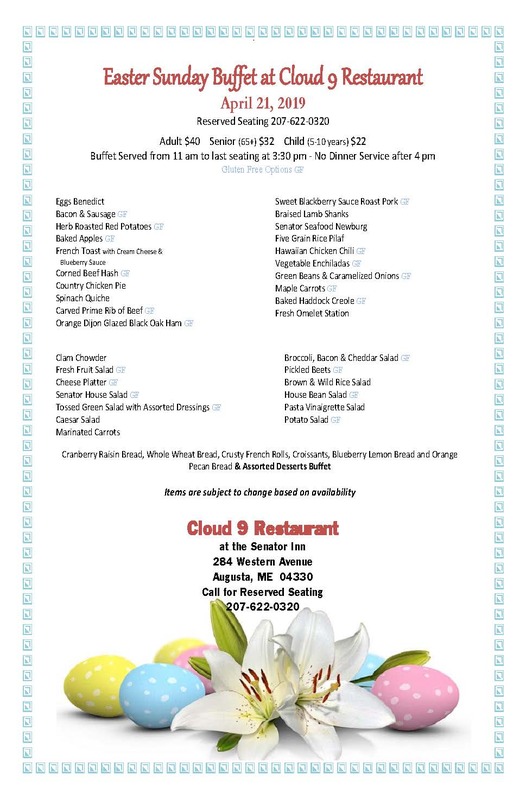 Award-Winning Cloud 9 takes the Senator Inn & Spa experience to the Dining Room in our Augusta Maine Restaurant. Cloud 9’s fun, creative cuisine awakens the senses and engages the soul. Roasted Pear, Walnut and Gorgonzola Brick Oven Pizza Restaurant Hospitality Magazine. Congratulations to our pastry chef Alex Gordon – his recipe is featured in Restaurant Hospitality magazine. Freshly baked salmon or pan seared scallops as refreshing as a swim in our salt-water pool. Country chicken pie in rich puff pastry as comforting as our warm stone massage. Fresh local oysters, whole-tail lobster cocktail and our signature seafood sensation, featuring lobster cocktail, jumbo shrimp cocktail, fresh oysters, and local smoked seafood— each as unique as our raw earth spa pedicure. Cloud 9 sources local ingredients such as heirloom tomatoes, artfully smoked seafood, and small farm goat cheese. Our chefs craft and create innovative pizza in our brick oven. Generated from international travels we’ve harvested distinctive touches, such as our whimsical décor that enlivens each Cloud 9 wall. Whether you’re craving a light, vegetarian dish or are ready to indulge in a sumptuous, multiple course meal, Cloud 9 has a plethora of fun and creative offerings sure to satisfy you. Brunch – 11am to 2pm ***Please see our Events Page for Sunday Holidays as hours and pricing vary. Happy Hour Monday to Saturday from 4pm-6pm in the Oyster Bar Lounge with half price pizzas and $1 off draft beer. Ask about renting our private dining area or private party room! Cloud 9 at The Senator Inn & Spa in Augusta, Maine — Fun creative cuisine! Click Here to View Our Excellent Tripadvisor.com Reviews!